Sometimes I don't accept death gracefully. I am angry with the pain I see in the residue of death. I wonder why the young die, why the healthy die, why the ill hang on so long and why evil people thrive. I feel angry when I forget that death is really just an invitation to a much better life: a life where there is no need for tears or tombstones or ambulance sirens. In the meantime I have to learn what to do when I drive around a corner and grief finds me. I look at the stars: the stars God strung just to astonish us, the stars He named to reveal His bigness, His majesty and His sovereignty. I look at the stars because they remind me who God is. They tell me He is not spiteful but awe-inspiring. I remember that He is both the man who wept for His friend and the God who breathes light out His mouth. 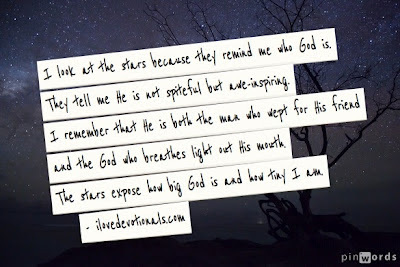 The stars expose how big God is and how tiny I am. I consider the stars and remember that they only burn so brightly because they are dying. As each star burns out and shoots across the sky, I am reminded that in each death I grieve, there is beauty and mystery, if I only choose to see it. What are some mysteries of life and death you struggle with? What experiences remind you of God's sovereignty in light of those?